Jypyä Pop (Turku, Finland) on 13 February 2018 in Animal & Insect and Portfolio. It is not always easy to duck life. 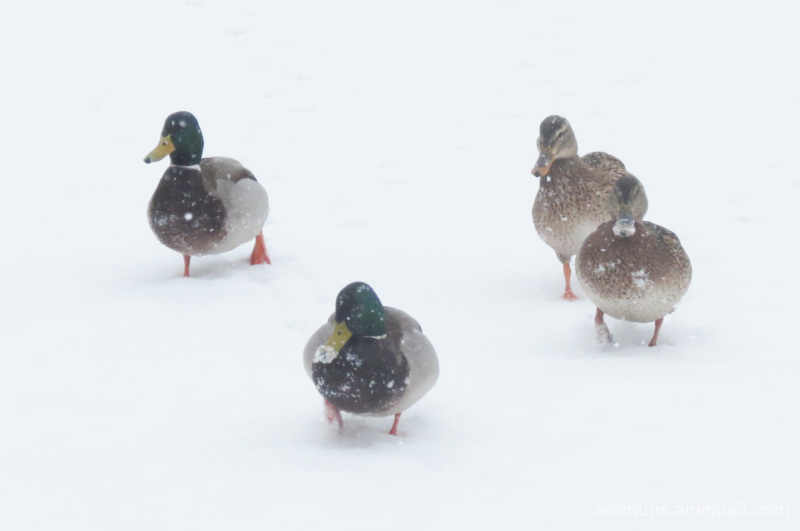 A very cute group of ducks during a snow. Super image. You choose an apt title! Awww . . always amazes me how easily they seem to adapt to this . .
@Ronnie 2¢: It's enough to close and close the closure and somebody bring food. they look ! So persistent..yes..hope somebody feeds them !! @Devi: Your wishes are fulfilled. Many people bring food for them. Anyway, they are so cute ! Yes, they are queuing up. Better have their food ready or they will peck your feet! Some real troopers here in these mallards as they trek through the snow!! It always surprises and yet, concerns me to see wild life in the snow. But bread is not good for them. Perhaps some corn or seeds. @Ruthiebear: Hni has no problem. People bring food and nearby there are places where they can find natural food. You are right grains are for them the better food. That title try to be humor. Superb capture and snowy ambiance . But spring will coming soon. @Claudiel: It is true. We must wait few weeks. Those ducks seem so forlorn in all that snow. @Steve Rice: They are used to this and when people bring food there is no reason to go further. @Harry: You said it. It is just so.